Oil and gas company, Horizon Oil, has donated much needed emergency and medical evacuation equipment to Kiunga Hospital. Horizon Oil Community Affairs Supervisor, Nick Wambare, when presenting the equipment said it was a small gesture to the hospital and hopes it will help save lives. “This is a small gesture to contribute to saving lives in the province which is a most important thing,” he said. Mr. Wambare explained that these equipment items were purchased for their exploration project and have hardly been used. They feel donating it to Kiunga hospital was the right thing to do. “We have not used these equipment from our exploration project and we have also given other medical equipment to Rumginae hospital and Catholic Health Services but we feel these emergency and evacuation equipment should go to Kiunga Hospital.” He explained. Hospital Administrator Graeme Hill thanked Horizon Oil saying this was not the first time the company has assisted the hospital. “I thank Horizon Oil as these will be a very useful contribution to the hospital. This is not the first time you have assisted,” he said. Mr Hill said the hospital is still to decide how to utilize the equipment, but thinks that equipping their ambulance to make it ready for use is a good option. 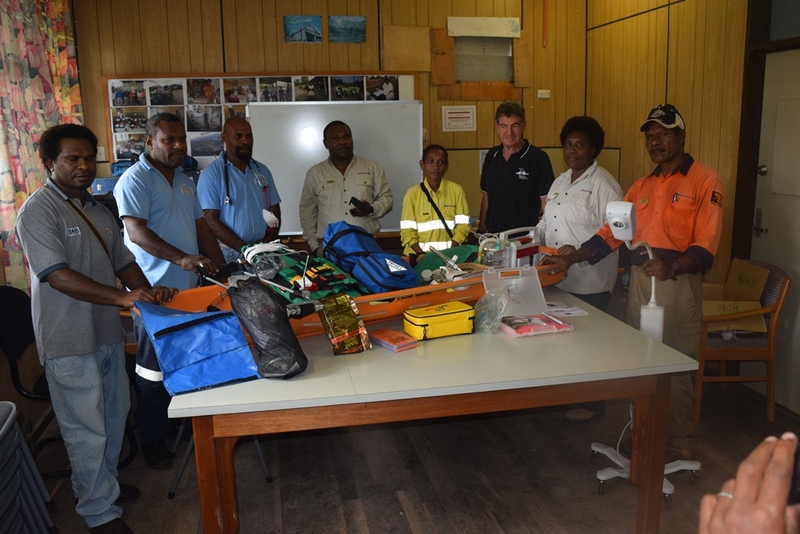 Dr Asael Kaptigau, who looks after the Emergency department at Kiunga hospital, said this was a timely donation. “A few weeks ago I asked Graeme about these exact items and today we get this equipment. I thank Horizon Oil as these equipment will boost our emergency capacity,” he explained. The emergency and evacuation equipment is worth over K21, 500 and includes items such as an aspirator, stretcher, traction splint, mobile examination light, resuscitation Kit, stabilizer and a suction pump. Kiunga Hospital is supported through the North Fly Health Services Development Program, a public private partnership between local health services, Ok Tedi Mining Ltd, Ok Tedi Development Foundation Ltd and Abt JTA as the implementation partner.